Shark movies can be both serious and straight-laced or they can be cheesy and dumb fun – or straight up campy – but there is no doubting you are probably bound to have some fun watching them. While shark movies – not you Sharknado – have kind of come and gone, there is one that eventually comes out and could surprise us. So is 47 Meters Down worth the deep dive? Let’s find out. The film follows sisters Lisa (Mandy Moore) and Kate (Claire Holt) as they are vacationing in Mexico. Lisa is recently getting over a break-up, and just wants to stay in the hotel, while Kate is the more adventurous sister, who is happy her older sister dragged her out on vacation. After partying with two locals in Louis (Yani Gellman) and Benjamin (Santiago Segura), they tell him they should trying cage diving with sharks. After some convincing from Kate and the guys, Lisa agrees. The next day they meet the guys and Captain Taylor (Matthew Modine), who put them in the cage and lowers them. Everything goes well at first, but eventually the winch on the boat snaps and sends the cage with Lisa and Kate in it down to the ocean floor. With their oxygen running low, and sharks within the area ready to attack, the sisters have to find a way to survive and make it back up to the surface. 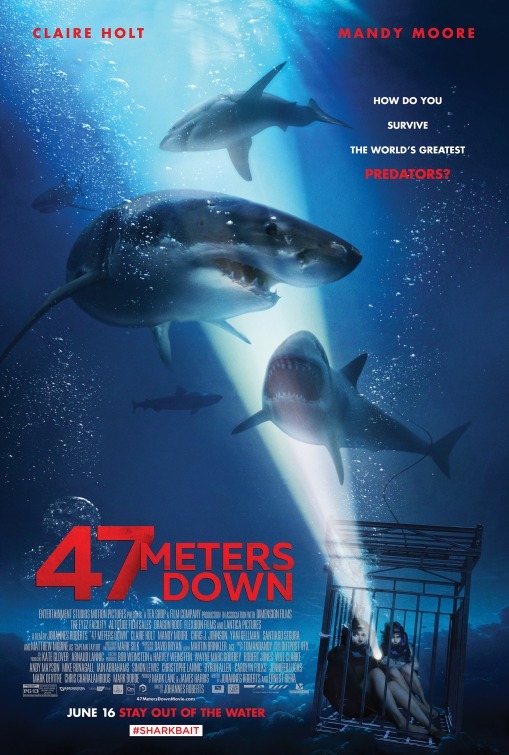 47 Meters Down is a bit frustrating. Not because it’s a overtly terrible movie, it’s actually pretty descent, but the movie is extremely underdeveloped. None of the characters are really fleshed out enough, which makes it a little hard to really root for them as we should. Sure we are hoping they’ll be okay when the sharks show up, but even when they scream and panic, it’s still a little hard. We know the bare amount of Lisa and Kate – Lisa is overly-cautious and doesn’t get out of her comfort zone enough, while Kate is the more adventurous and despite being the younger sister, she has to calm and convince Lisa into everything. The supporting characters are almost non-existent with Louis and Benjamin disappearing as soon as they appear, and Matthew Modine’s Captain Taylor is heard through a walkie-talkie the sisters have and even comes off as shady when he’s introduced. The movie does work better on the technical side of things. 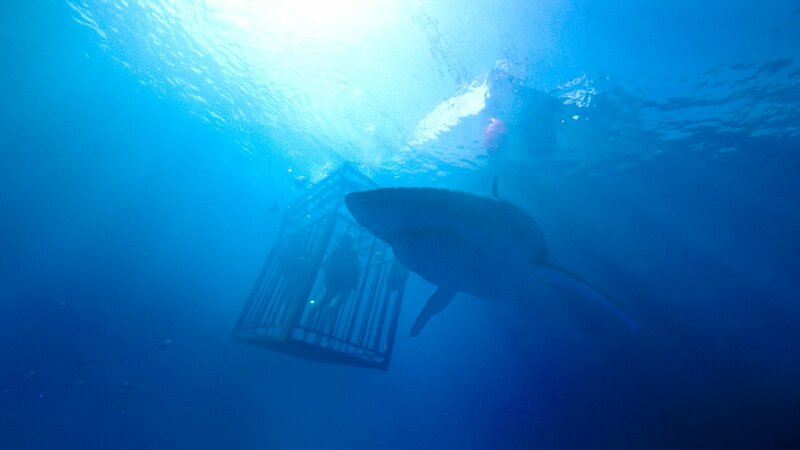 Cinematographer Mark Silk sets up some effective low-light shots that makes the shark attacks unpredictable and adds some much needed tension to the film. Also, it helps that there is not music building up to a potential attack either, essentially putting us in the Lisa and Kate’s shoes for most of the film. Even on that end, director Johannes Roberts makes some of the action hard to follow and lingers on other shots for far too long, which doesn’t make sense since the film clocks in at right under an hour-and-a-half. All in all, 47 Meters Down is only a descent movie that never reaches its potential full potential. Even with some okay scares with its great cinematography, the characters are never fully developed which hurts the film at the end. There is also a little something thrown in at the end that I’m eager to see how people react too. Personally, the film doesn’t really earn it.